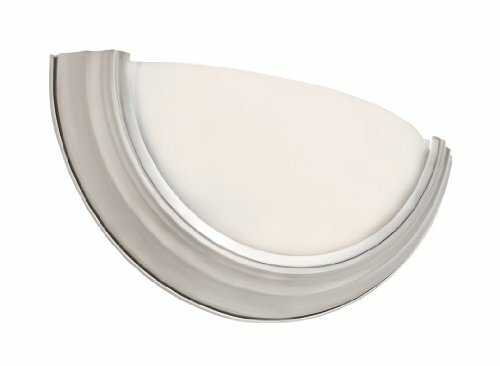 The Ray Collection exhibits a unique wall sconce that is perfect for adding supplemental lighting to any interior wall space. The Transitional tone allows the wall sconce to stand out as both functional and decorative as it lights up any interior setting. 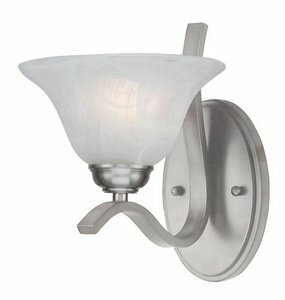 The half round Ray 12.75" Wall Sconce is flush to the wall, trimmed in metal and has a White Frost glass shade. The Ray Collection offers both energy-efficient and non-energy efficient wall sconces. The small scale and understated design makes the Ray Collection easy to coordinate with any style. Bulb Type: Incandescent. For Indooruse. Type of glass is White Frost. The materials used are: Metal, Glass, Electrical. The Finish is Brushed Nickel. Bulb base is E26. The bulb is not included. This item is dimmable. The bulb shape is A19. Dry listed. Warranty details: One year limited Warranty. The Aria Collection is perfect for adding a warm glow to any outdoor area. The fixture provides a subtle accent to any home exterior and complements a variety of design themes. The Aria 8" Bulkhead is a Nautical themed fixture that maintains popularity with its timeless bulkhead style and traditional round ship window form. The metal frame encases the Ribbed Frosted Glass lens. The closed design also makes the Aria Collection a great choice for basement, attic, and storage room lighting. Bulb Type: Incandescent. For Outdoor use. Type of glass is Ribbed Frost. The materials used are: Metal, Glass, Electrical. The Finish is Black. Bulb base is E26. The bulb is not included. This item is dimmable. The bulb shape is A19. Wet listed. Warranty details: One year limited Warranty. 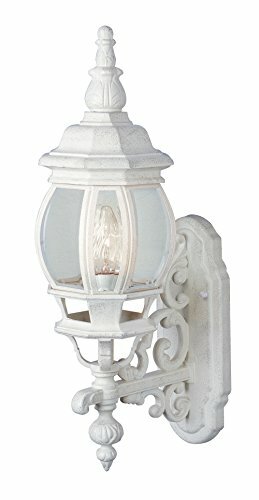 The Francisco Collection adds a taste of Tuscany in outdoor house lighting. It is a perfect complement for French architecture, designed to match the look and feel of your home and crafted to deliver years of reliable performance. 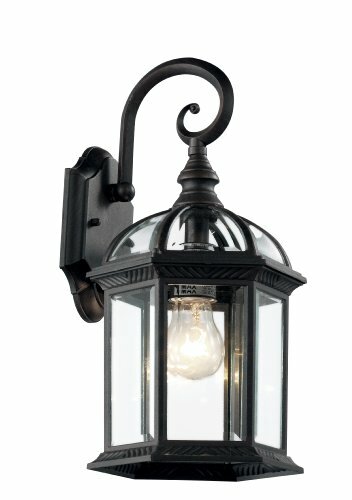 This single light wall fixture provides both light and extra charm in the evening hours. 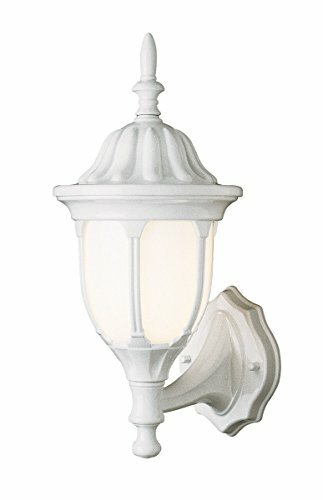 With the classic design and multiple finish choices, the Francisco 20.5" Wall Lantern makes a great choice to highlight a wide range of styles. Bulb Type: Incandescent. For Outdoor use. Type of glass is Clear Beveled. The materials used are: Metal, Glass, Electrical. The Finish is White. Bulb base is E26. The bulb is not included. This item is dimmable. The bulb shape is A19. Wet listed. Warranty details: One year limited Warranty. Trans Globe Lighting PL-2825 BN Hollyslope Indoor Brushed Nickel Traditional Wall Sconce, 7.5"
The hollywood Collection exhibits a unique wall sconce that is perfect for adding supplemental lighting to any interior wall space. The traditional tone allows the wall sconce to stand out as both functional and decorative as it lights up any interior setting. 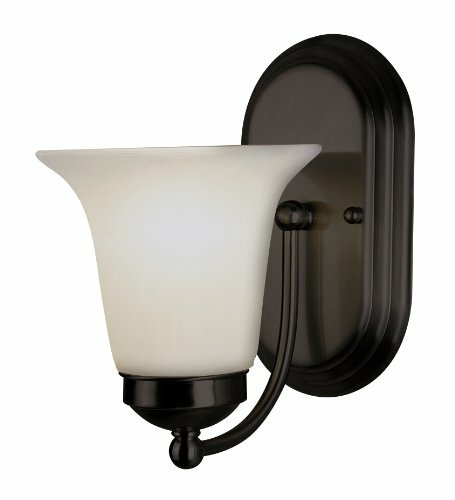 The hollywood 7.5 inch wall sconce features a curved arm that extends from a centered oval wall plate, and includes a single marbleized glass bell-shape shade. 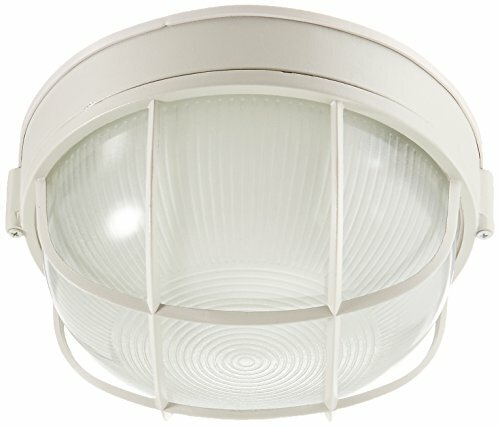 This fixture can be mounted with bulb facing up or down. The Rusty Collection exhibits a unique wall sconce that is perfect for adding supplemental lighting to any interior wall space. The Traditional tone allows the single light Rusty 6" Wall Sconce to stand out as both functional and decorative as it lights up any interior setting. The Rusty Collection features include Marbleized Glass shades, curved arms with knobbed ends, and decorative oval wall plate. This simple yet sophisticated style will complement a wide variety of decor and is easy to coordinate with your existing pieces. Bulb Type: Incandescent. For Indooruse. Type of glass is Marbleized. The materials used are: Metal, Glass, Electrical. The Finish is Rubbed Oil Bronze. Bulb base is E26. The bulb is not included. This item is dimmable. The bulb shape is A19. Damp listed. Warranty details: One year limited Warranty. The Aria Collection is perfect for adding a warm glow to any outdoor area. The fixture provides a subtle accent to any home exterior and complements a variety of design themes. 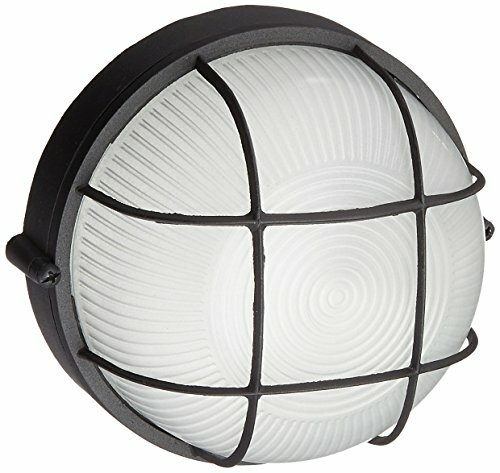 The Aria 10" Bulkhead is a Nautical themed fixture that maintains popularity with its timeless bulkhead style and traditional round ship window form. The metal frame encases the Ribbed Frosted Glass lens. The closed design also makes the Aria Collection a great choice for basement, attic, and storage room lighting. Bulb Type: Incandescent. For Outdoor use. Type of glass is Ribbed Frost. The materials used are: Metal, Glass, Electrical. The Finish is White. Bulb base is E26. The bulb is not included. This item is dimmable. The bulb shape is A19. Wet listed. Warranty details: One year limited Warranty. This Wall Sconces 1 light bulb fixture from the Aignon collection will illuminate and enhance your home with a perfect mix of form and function. The features includes White finished color applied by experts. The Villa Nueva 21" Wall Lantern combines Spanish design themes with functionality. The Villa Nueva Wall Lantern offers both accent lighting and supplemental area lighting as it stands out and showcases the outdoor decor. Set the ambience for your guests as they arrive and invoke the spirit of the Mediterranean with this wall lantern from our Villa Nueva outdoor lighting collection. 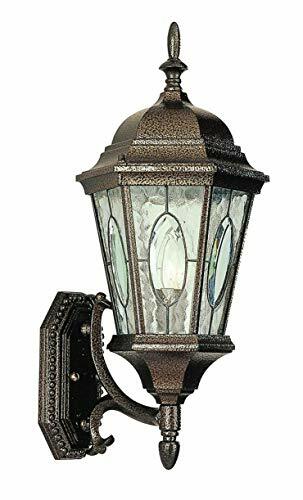 Functional yet elegant, this lantern has ornate details, two types of glass, including a center oval glass accent and one light. Creating a romantic atmosphere in any outdoor living space, this is the perfect choice to illuminate a garden seating area, either side of the garage door, a patio area or at the front of the house. Bulb Type: Incandescent. For Outdoor use. Type of glass is Clear. The materials used are: Metal, Glass, Electrical. The Finish is Brown. Bulb base is E26. The bulb is not included. This item is dimmable. The bulb shape is A19. Wet listed. Warranty details: One year limited Warranty. 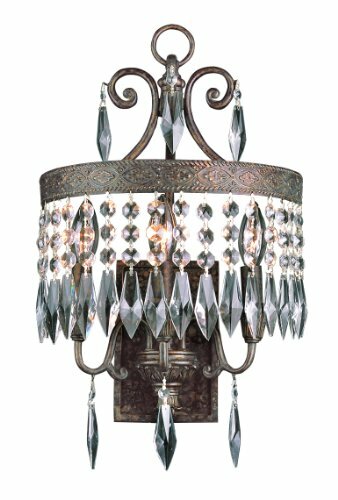 Trans globe's crowned crystal 3-Light Sconce is part of trans globe's middle Eastern crowned indoor chandelier and pendants collection, rich with crystal bead strands and darkened bronze leafing. Other features include: rich with leaf detail and stamped metal band frame, tiered layers with crystal strands, and a square framed wall plate in patina finish. Size: 7.5" x 10" x 9.88"7.5\" x 10\" x 9.88\"